When the 3rd Generation of Pokemon was said to be coming soon to Pokemon GO, most players expected Rayquaza to be just as good as both Groudon and Kyogre. Shoot, it would be safe to say that most players expected it to be better than the two, since it was the Pokemon that saved the world when the two fought so long ago. Unfortunately, however, when the 3rd Generation finally did come to Pokemon GO, players were shocked to find that Rayquaza was significantly weaker than both Kyogre and Groudon. And when we say significantly weaker, we mean it, as Rayquaza is about 400 Combat Points weaker than the two when all of them are at their best. This is an extremely big drop off in terms of powers, and it’s exactly why Rayquaza can’t say it is the best Legend presently found in the game. Shoot, Rayquaza is only as good as Latios in terms of Maximum Combat Power Level, having almost an identical stat to not even a Cover Legend! Still, even with Rayquaza being far and away nowhere near the best of the best Legendary Pokemon found within Pokemon GO, it is still one of the ten best presently found in the game, possibly even one of the five best. 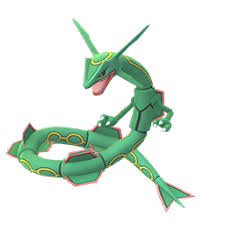 What makes Rayquaza also stand apart is how is will also be receiving a Mega Evolution in the not so distant future of Pokemon GO, and when it this form, Rayquaza is the strongest Pokemon found in the entire Pokemon Universe. Rayquaza will have to accept the fact that it isn’t the best Legend right now in Pokemon GO, but its time will come around sooner rather than later.